We had a beautiful, sunny weekend here in Charlotte. Friday night was a low-key evening, much needed! Ian and I made our favorite flatbread pizzas and watched a Dateline episode. We also did lots of tidying up since I was hosting a baby shower the next day! My sister and Mom arrived in town around 11 on Saturday, and Laura and I went to a consignment sale while Mom stayed at home with Camille. 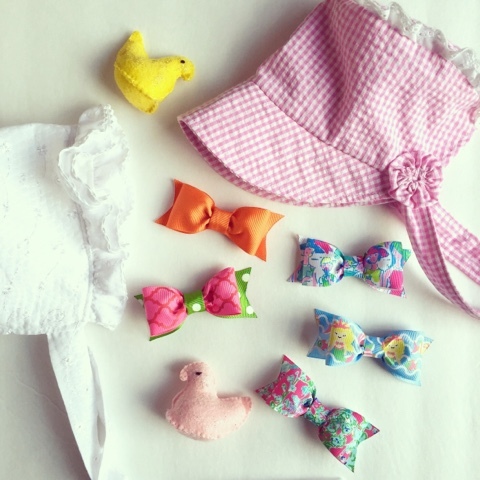 I did score several new little outfits for Camille, mostly playclothes in size 2T. Since we just went for the half-priced portion of the sale, I was getting some little t-shirts for $0.50 or $1, and I think the most I spent was $6 for a Tea Collection dress. Laura picked up some adorable little blue clothes for her sweet baby boy, due at the end of May. The shower was so lovely and relaxed, and I'll be posting photos tomorrow! Here's the mama-to-be with me and my fellow cohostess, Laura's sister-in-law. Once all of the guests left, Ian and I took Laura and her husband T to Chuy's for dinner. You can tell that Camille is a BIG fan of her uncle. :) Worships him. Sunday was nice and lazy, but the highlight was a family "picnic" outdoors for supper. Typically, Camille will eat around 5:45 and go to bed at 7, which is when Ian and I will eat. I have started thinking that it may be really beneficial for us to all eat together when possible. I did notice last night that she CLEARED her plate, and I think part of that was watching us eat the exact same food. 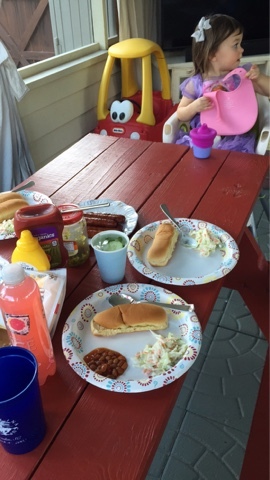 We grilled out hot dogs and had coleslaw. Camille and Ian also had some baked beans. This morning when I picked her up from out of her crib, her first words were "Eat ... picnic!" so I think that she just really loved it and it made a positive impression on her. So sweet. We have already had a great playdate visit with friends this morning, and Camille's currently napping. It's back to making more bows for me, and gearing up for the craziness of the Bachelor finale tonight! Ahhh cannot wait for the Bachelor!!!! Both you preggo ladies look amazing!!! It's sad how excited I am for the Bachelor tonight... team Lauren B! Oh my goodness, that picnic and how Camille responded to it is just so precious!! Cannot wait for the bachelor tonight!!! It's going to be absolute craziness! 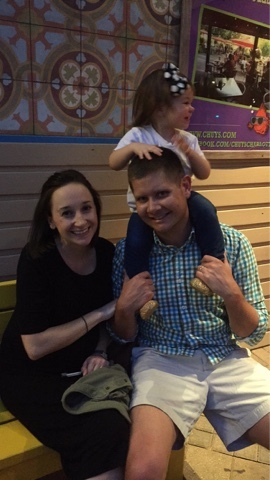 Team JoJo (minus crazy big brothers)! I love a family "pic pic" as we call it in our house! Be safe this weekend at the show & I hope it's a huge success! We have the same dinner routine here. I keep saying I want to eat together, but with my husbands work schedule it's not really possible. Maybe one day! Ooo you're getting so close! A few months ago we started getting better about sitting at the table whenever possible to eat with Lawter, even if it's just us having some cheese and crackers for veggies and dip or something while she eats her dinner, if it's not a night that we can all eat the same thing at the same time. She really seems to enjoy it, and I noticed some changes in her table mannerisms now as well. We live an hour and a half from our hospital, baby boy made a pretty fast arrival and we still made it, so just be mindful of any peculiar feelings ; ) ha!